Category: Mens Duo & Womens Duo. Each team member will complete 50km and the total finish time of each member will be the total finish time of the team. team member may run individually and need not cross the finish line together. I guess this will be my next BIG project next year. Find a teamate and and start training. 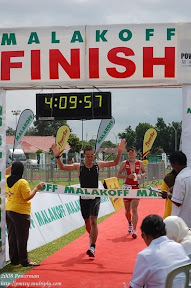 To complete 50km in 8 hours is easy for road race but for trail running, that is a challenge. 50km, I can complete around 6 hours max for road race and if it is off road, then add another 2 hours. That would be enough - 8 hours. Who will I offer to be my running partner?? ?